Uniquely Seven Lakes West…. Live like you are on vacation! The sparkling waters of the 800-acre spring-fed Lake Auman with its swimming, sailing, fishing, and recreational boating activities are available only to Members and their guests. In the Morganwood addition there are five-acre wooded lots where equestrians can enjoy their dream homes, surrounded by riding and nature trails. Non-equestrians may simply want the privacy and natural beauty this area has to offer. Enjoy the safety and security of living inside this 3000-acre gated community, while benefiting from the close proximity to one of the nation’s “100 Top Hospitals”, plus the charm of the nearby Pinehurst, Southern Pines, and Aberdeen villages. The West Side Park Campus features a beautiful, two-story Community Center with a library and a Great Room, which hosts numerous social functions and activities such as Yoga, Thai Chi, card clubs, cooking classes, and more. The Center is surrounded by outdoor amenities such as a swimming pool with summer water aerobics, a gazebo, playground, tennis courts, basketball courts, and a nature trail. The Beacon Ridge Country Club and Golf Course, designed by renowned architect Gene Hamm, is one of the prettiest golf courses in the Sandhills region of North Carolina, and is also located within the gates of Seven Lakes West. A 3000 Acre Gated Community! 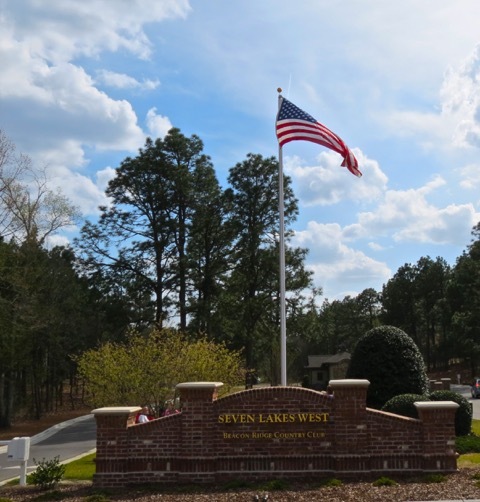 The unincorporated village of Seven Lakes is located eight miles west of Pinehurst, NC in Moore County. It consists of Seven Lakes North, Seven Lakes South, and Seven Lakes West. A population of approximately 5,000 residents makes Seven Lakes the third largest community in the area. This beautiful area is known as the Sandhills region, where the majestic Longleaf Pine Trees thrive in our sandy soil. The area has four distinct seasons with temperate temperatures and lots of sunshine. Moore County is home to families with many diverse interests. Aside from its world renowned golf courses and resorts, the residents enjoy a full spectrum of equine activities including driving, dressage, fox hunting, and hunt trials, as well as pleasure riding. Agriculture has always played an important part in the county's economics, however, today's major industries include tourism, healthcare, and education. Academically challenging opportunities are available to all students within the Moore County School system. A comprehensive curriculum K-12 includes workforce development, programs for special needs and gifted students and arts education. All three high schools offer a variety of Advanced Placement courses. Continuing education opportunities abound at the nearby Sandhills Community College. This highly respected institution offers local residents the opportunity to indulge in educational exploration and partake in the many cultural events held on campus. Both curriculum (college credit) and continuing education (non-credit) classes and programs are offered for individuals with varied educational needs and backgrounds. Classroom and online courses are taught day and evening throughout the year both on and off the main campus. Moore County is also fortunate to have its own single runway public airport facility that successfully serves landing requirements for private aircraft, including many corporate jets. This airport is a convenient resource for access to our local amenities and golf resorts. The nearest commercial flights may be booked through the Raleigh Durham Airport, the Piedmont-Triad International Airport in Greensboro, and the Charlotte Douglas International Airport.